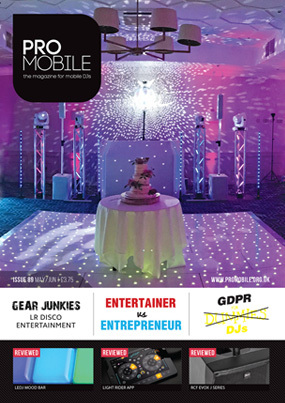 The May/June 2018 edition of Pro Mobile is once again packed with an eclectic mix of articles, views, news and reviews for mobile DJs. It includes a Profile article from Paul Radmore of Devon DJ and reviews of the new Pioneer DJ RB-DMX1 lighting control system, Equinox DJ Mood Bar lighting effect, HH Electronics TNX-1201 full range active speaker, CHAUVET DJ H1 portable wireless wash fixture, Light Rider DMX control app and RCF EVOX J Series active portable PA system. As usual, there's also a great collection of articles and features, including a DJ's guide to the new GDPR data protection regulations, a look at some of the most successful debut singles of all time from Greg Cartwright, advice for marketing to millennials from leading New York Wedding Photographer Vanessa Joy. Euan Bass also shares a personal story and uses it as a cautionary tale for all DJs, Brian Buonassissi shares his company's formula for following up on enquiries, new contributor Rob Ferre considers whether mobile DJs are primarily entertainers or entrepreneurs and Richard Lee looks at the close link between film sound tracks and DJs' dancefloors. Brian Buonassissi, Eddie Short, Euan Bass, Greg Cartwright, Ian Forest, James Humphrey, James Mackie, Mark Walsh, Paul Radmore, Richard Lee, Rob Ferre and Vanessa Joy. ADJ, Bishop Sound, Bose, CHAUVET DJ, Cobra Case, DAS Audio, dB Technologies, DJ Event Planner, djKit, DMC, Fabtronic, FBT Audio, Gemini, GIG, HH Electronics, Highlite, insure4music, Light Rider, Mastermix DJ, NovoPro, Peavey, Phase One, Pioneer DJ, Pro Mobile Conference 2019, Promo Only, QSC, RCF, Reloop, Rock N Roller & Subsafe.